You know when you have been looking for the perfect item (for example, the perfect chambray or blazer) and you finally find it? The second you try it on and you know, you feel absolutely triumphant and giddy and you instantly start imagining all the different ways you can wear it. 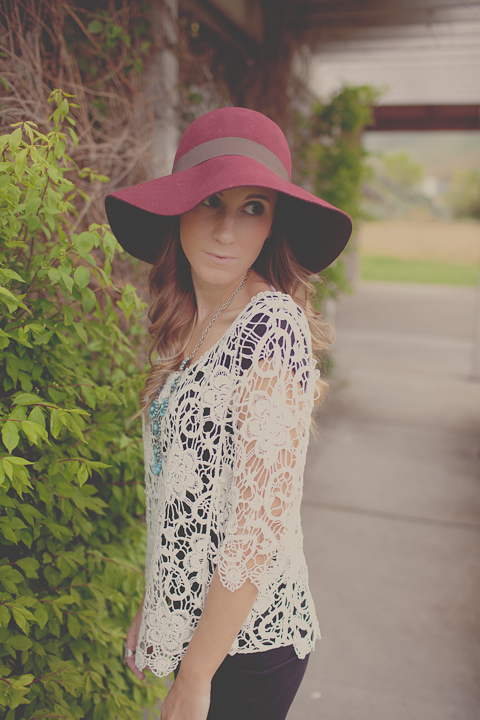 These are my current feelings towards this crochet knit pullover from Rire Boutique. The crochet detailing is gorgeous, the fit is perfect and slightly flowy, and it has super cute sleeves. This is a must for my closet this summer, as it is the perfect top to throw on over a dress or tank for cooler days and evenings and how cute would it look as a swimsuit coverup?! I paired it with a black bodycon dress, a bold turquoise necklace, combat boots and my favorite hat for a festival worthy outfit (coachella next year, anyone?). Oh Ashley, I adore this loook! That see through crotchet top really is perfect. I can see it being worn so many different ways, just as you said. Those sleeves are so billowy and such a good length, and I adore the scalloping on the top. what an adorable look. love your top. Yup, you found the perfect top Ashley! I love this crochet texture, it'll be so awesome for summer, and as a swimsuit cover up. Also, how adorable are you in that floppy hat? Too cute! By the way, congrats to your boy on graduating – bet you're happy he'll be around 🙂 I saw the pic of you two, and yes, you are officially one of the cutest couples around! Such a cute top- and love the hat, too! Ashley this is too gorgeous! I have a similar top but its cropped, I'd love to have this version too….haha. I have a lot of similar pieces so you're definitely giving me inspiration here! So beautiful. Love love loooove this outfit! Girl, it is perfection! 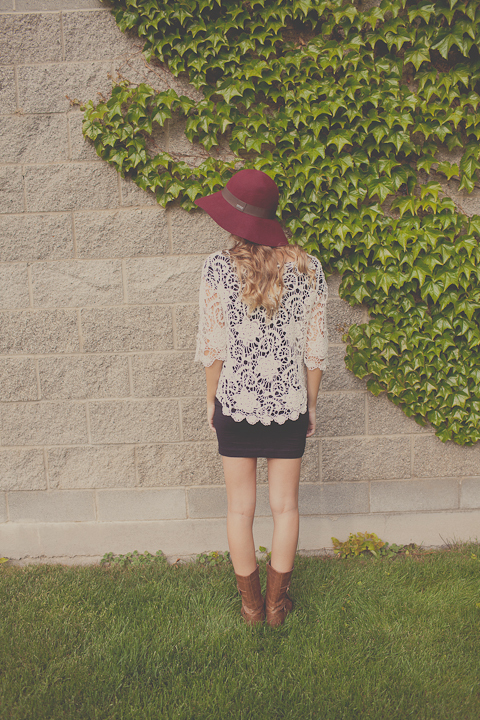 That hat is too cute, and I think I need some little combat boots in my wardrobe, too! I love this adorable hat on you. The burgundy color is a great way to mix it up! 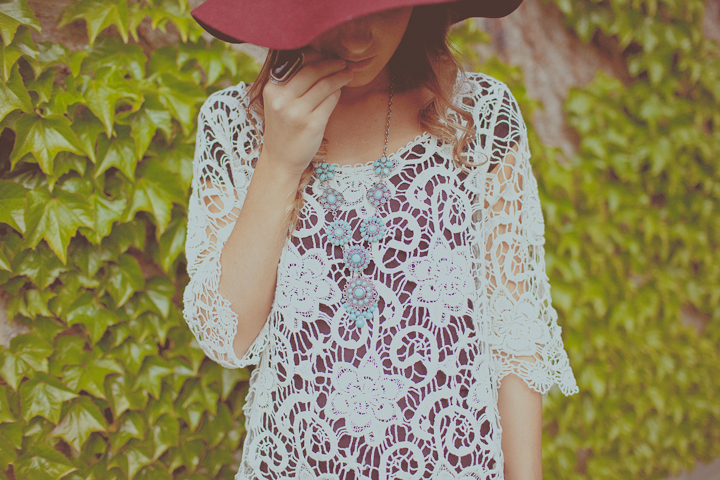 That lace top is absolutely gorgeous on you…such a cute look! I love this look. Amazing.